Last month we showcased Stickyworld at the Public Sector Show in Manchester. It was interesting to meet and talk to so many people across the sector all involved in creating smarter, better public services. What came through was the common problem of how to involve all your stakeholders in the transformation process. And, given the drive towards digital transformation generally, it seems obvious that you should start with digital tools to manage the process, creating the opportunity for more people to contribute to shaping the outcomes, de-risking adoption and increasing efficiency and productivity in the transformation process. This post was originally posted on the show website. The most ambitious programme of change of any government, anywhere in the world, is taking place in the UK. As we learn, the vision is to transform the relationship between citizen and state, using digital technology as a means to deliver that transformation. But is it possible to truly transform at the pace and scale demanded without also embracing the right digital technologies to assist the management of that process? Doesn’t the very process of transformation itself needs its own digital tools? At Stickyworld, we think those involved in transformation projects could look to modern digital platforms to engage stakeholders involved in that transformation, and capture their knowledge, ideas and feedback on proposals. Our customers across the public sector are already finding new ways to use our consultation and engagement platform across their organisations, applying principles already tried and tested with communities to build consensus and readiness. The government digital strategy outlines three areas for transformation. These include 1) digitisation of whole citizen-facing services, 2) delivery of policy objectives by departments in a flexible way and improving citizen services across channels, and 3) internal government transformation to collaborate better and deliver digitally-enabled change more effectively. To do this, government departments will need to collaborate across their traditional organisational boundaries and become more responsive to adapt to an ever changing environment. Change is always hard, but true transformational change, at pace and at scale, is the hardest. This is because there are many moving parts in the puzzle, and multiple stakeholders involved who are affected by the change. To achieve this kind of transformation, it doesn’t just demand greater collaboration in the sense of working better and closer together. It also means engaging, consulting and listening to feedback. There are two approaches to change, one that is dictatorial, and one that is inclusive, engaging everyone fully and properly in that change. Only the latter approach delivers sustainable and effective change, giving everyone an opportunity to become aligned, share critical knowledge, identify risks involved and offer ideas and feedback. The usual way is to carry out stakeholder consultations, focus group meetings or workshops in the endeavour to include everyone, and get it right first time. But relying on these traditional face-to-face solutions alone will no longer work. People are busy; they can’t make the meeting or workshop. Relying on them reading the whole email and opening attachments is pretty risky. If you simply send out a survey, can you be sure that everyone is on the same page and properly understands what is proposed? If people attend the workshop, how can you carry on the conversation and pick up the afterthoughts? To align with government digital strategy, those responsible with transforming government into a digital organisation need to build their own digital engagement capabilities for reaching far and wide to all stakeholders. At Stickyworld, we’ve developed a cloud-based service that makes it easy for organisers to prepare and publish online consultations, workshops and focus groups, making it super easy to engage stakeholders in discussions about all kinds of change and keep the opportunity to have a say open for a specified time. The tool combines components of marketing automation and collaboration technologies to offer a service that can transform the efficiency and effectiveness of stakeholder consultations, both inside and outside the organisation. We are seeing this in action with our customers across the country. 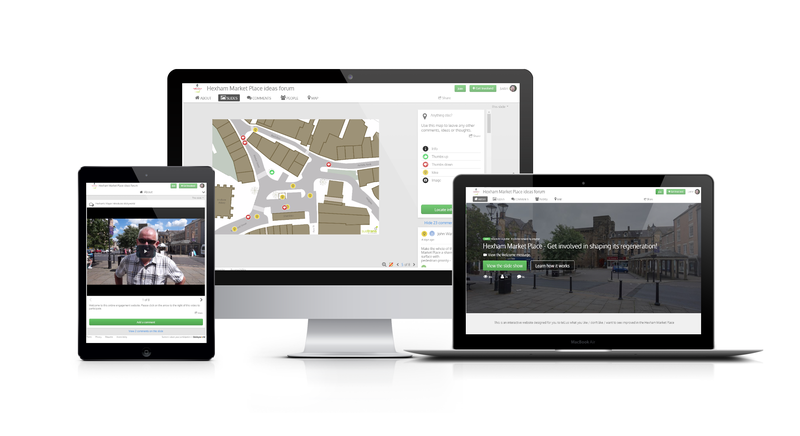 From Kent County Council to Northumberland, Stickyworld is used for engaging citizens about new services, policies and regeneration projects. And now, some councils are starting to use the platform internally across departments and services, to consult on service transformation and to engage staff. If you are involved in the transformation of government services or organisational structures and would like to know more about how Stickyworld provide a smarter way to engage different groups around rapid change at scale, get in touch. We'd love to talk to you.